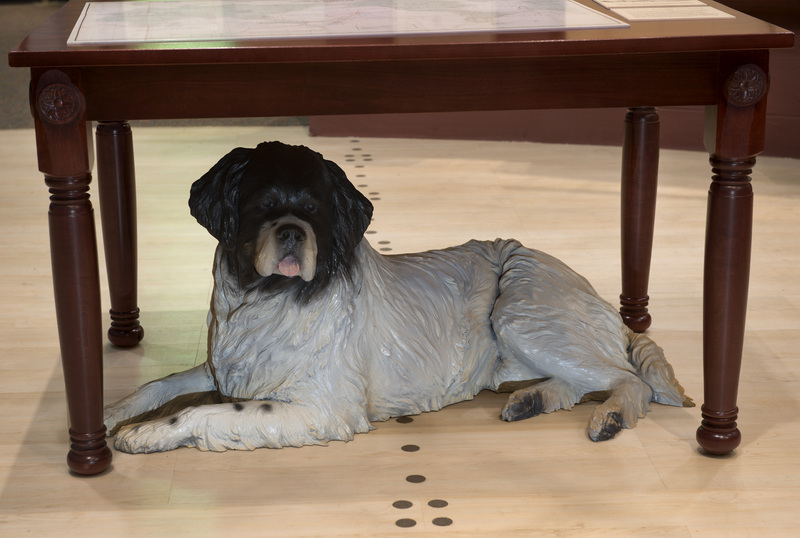 The newest addition to the Time and Navigation gallery is a life-size bronze statue of a dog named Sydney. Sydney now reclines amiably on the deck of the exhibition’s ship, and our youngest visitors are finding him appealing. On a recent morning, one toddler was observed patting the statue’s head and squealing, “Puppy!” Another clambered onto Sydney’s back and went for an imaginary ride. But our bronze dog isn’t just for fun for the under-five set. He has four paws firmly rooted in history. The original Sydney was the pet on the USS Vincennes, flagship of the U.S. Exploring Expedition. 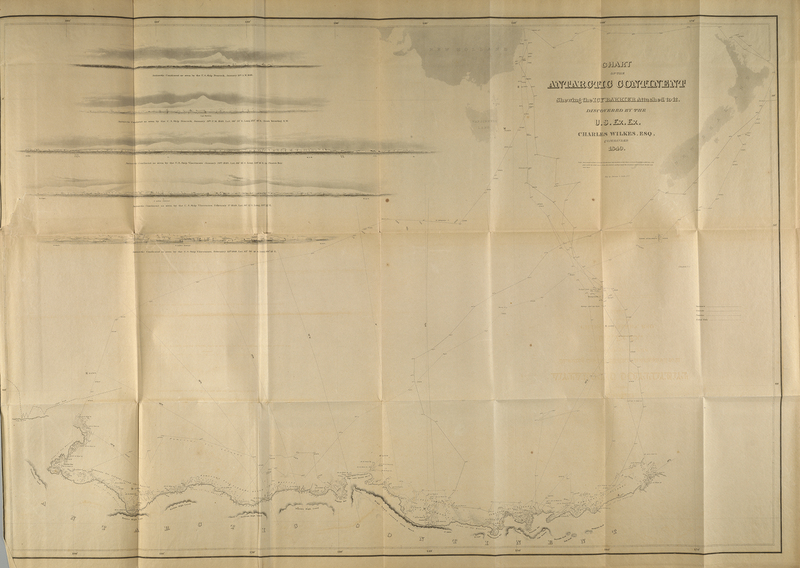 Funded by the U.S. Congress, the expedition traveled the world between 1838 and 1842. Its six-vessel Navy squadron mapped uncharted waters and expanded American commerce, industry, and scientific knowledge. The expedition returned with an estimated 40 tons of animals, plants, and ethnographic artifacts that would become the foundation collections for the U.S. Botanical Garden and the Smithsonian Institution. 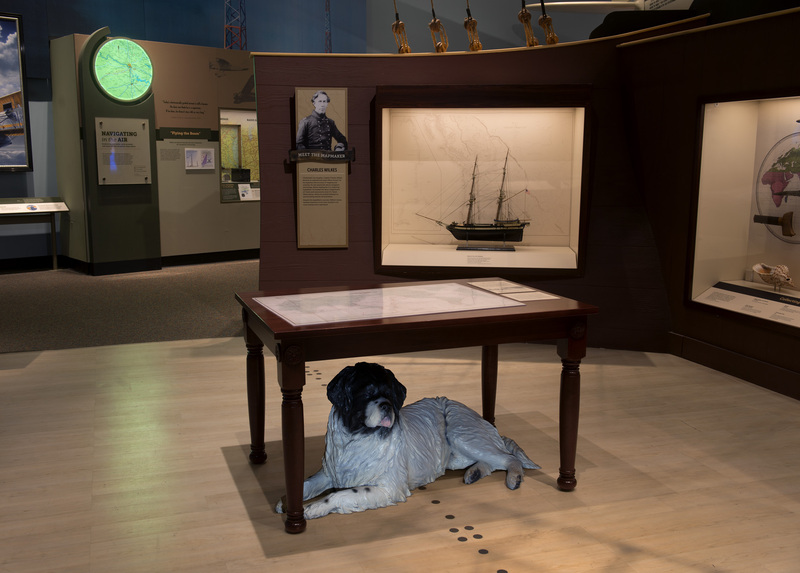 The governor of Australia reportedly gave Sydney (the dog) to the expedition’s commanding officer Charles Wilkes when the squadron called into Sydney for provisions in 1839. Beginning in late December that year, Sydney set sail across the Pacific with the squadron. 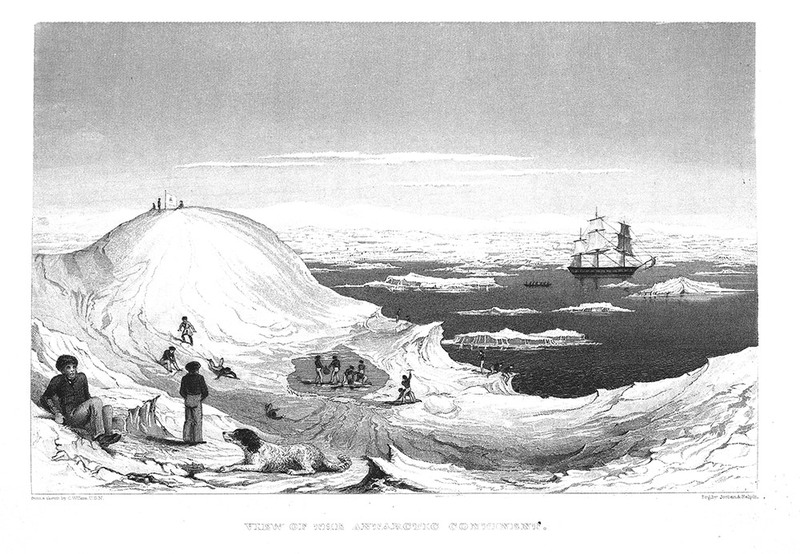 His first major stop was Antarctica, where he had a chance to stretch his legs on an iceberg, as shown in a sketch by Wilkes. Charles Wilkes, captain of the U.S. Exploring Expedition, sketched the scene (image three in the slideshow to the right) of his crew and his dog Sydney as they relaxed on a small iceberg near the coast of Antarctica. Wilkes himself is the figure at the lower left. Later in the expedition, Sydney would experience the opposite to this frigid surface. While accompanying his shipmates on an exploration of Hawaii’s Kilauea volcano, he scorched his paws on hot lava. One very warm and pleasant night, in the mid-watch, seeing three of our quarter growlers (old sailors) taking a siesta on deck, and enjoying our big dog, Sydney, as a pillow, I hunted up a bone and place it about a foot from the dog’s nose. As soon as Sydney got a smell of the bone he suddenly sprang up, and the sleepers’ heads came down on deck with a thump. Such a growling! Why, they were like three old bears with sore heads. From Charles Erskine we know too that Sydney was still with the expedition in 1841, when the squadron celebrated the 4th of July with an all-hands parade at Fort Nisqually (near today’s Tacoma, Washington). Wilkes was at the head of the parade, and Sydney trooped happily along farther back with Vendovi, a member of Fiji Island royalty held captive by the expedition. But after that, we lose the big dog’s trail. It’s a treat to see him reappear in Time and Navigation. See details on how our colleagues at the Smithsonian’s Office of Exhibits Central made the bronze statue of Sydney. Charles Erskine, Twenty Years Before the Mast: With the More Thrilling Scenes and Incidents While Circumnavigating the Globe Under the Command of the Late Admiral Charles Wilkes, 1838-1842 (Philadelphia: George W. Jacobs & Co., 1896). Autobiography of Rear Admiral Charles Wilkes, U.S. Navy, 1798-1877 (Washington, DC: Naval History Division, Department of the Navy, 1978).